This past Saturday I was honored to participate in the Acme Family Day at the Stockman and Dakota Coral as a celebrity griller. That is not a typo – I am now officially a celebrity. 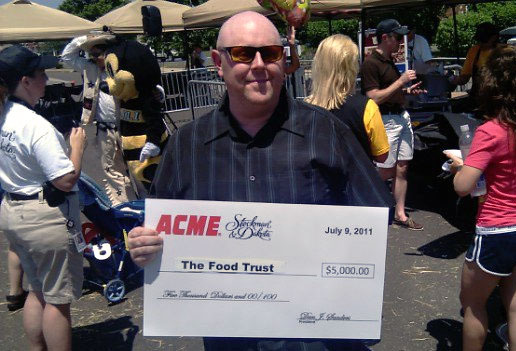 And if that doesn’t move you, I will go even further to say that I won the grilling showdown and my charity, The Food Trust, received a $5000.00 donation as a result. While all of this is awesome news, my wife is now in the market for a contractor to widen our doorways due to my increased head size. Remember that scene in “How the Grinch Stole Christmas” when the Grinch’s heart grew really big really fast? Imagine my already big bald head instead of the Grinch’s tiny heart and you’ll get the picture. Though the competition was stiff – Lori Wilson , anchor at NBC 10 and Shannon Shaffer, blogger at fortheMommas.com, ultimately I prevailed. I think the tide might have been turned by my vote glomming and baby kissing (literally, I had my sister-in-law bring my 2 ½ year old son so I could be kissing babies). He had fun too! The “Coral” was actually the parking lot of the Acme off of Red Lion Road in the Great Northeast, converted to the Wild West with bales of hay and cowboys. Yee Haw! It was a great day for this celebrity blogger and even a greater day for the Food Trust. Thanks to Acme for making it all possible!